Summer Greetings to all So Cal Flame Surfers! Hope our extreme summer heat has not kept you too far from the torch. Thanks to all that came to our June meeting at Pacific Art Glass. We had a wonderful demo from Susan Haskell on making blown vessels. Members also shared examples of vessels they had made for Show and Tell. Your creativity and skill always amaze me. September will be a busy month for us. 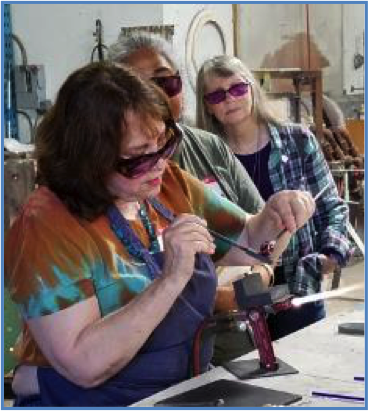 We have two events occurring at Pacific Art Glass. First, we have our next general meeting on September 8. See below for details. Then, the following Saturday (9/15) we will host a special Beads of Courage event. 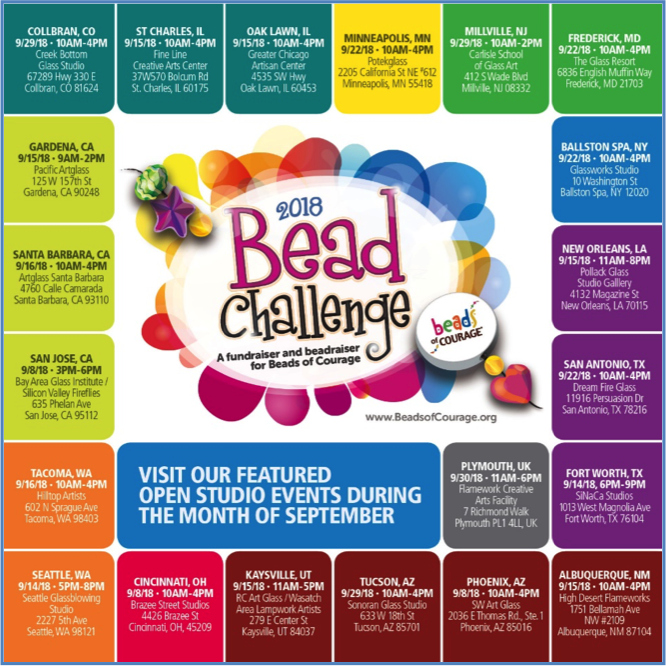 We will be participating in the 2018 BOC Bead Challenge by having a dedicated day of bead making in combination with an Open Studio open to BOC members, families, and medical staff. Many thanks to John Williams at Pacific Art Glass for his generous support of our club. I hope you will be able to join us for both events and make September extra special. Thanks to your hard work, we donated over 2,000 beads to BOC last year. However, our bead donations this year are far below last year’s pace; we have sent BOC only about 400 beads so far. I’m asking everyone to make at least 10 courage beads each month for the remainder of the year. With your help, we can still donate at least 1,000 beads in 2018. As an incentive, we will be providing special prizes to members that bring in the most courage beads to each meeting. Finally, the SCFS web site will be getting a makeover this year. Web mistress Susan Walter is giving our web site a new look, with additional features that highlight our members and activities. 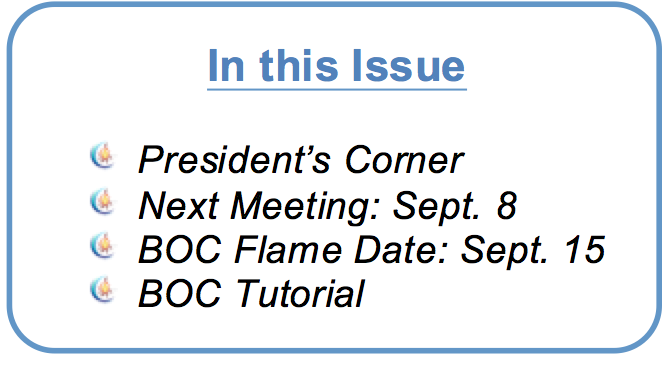 Come to our next meeting for an update on our progress. Many thanks to John Williams and the staff at PAG for hosting our meeting and supporting SCFS events. We will provide drinks and snacks during the meeting. You are welcome to join us for lunch afterwards. If you haven’t renewed for 2018 yet, please remember to bring money to pay your annual SCFS membership dues so you can participate in all our 2018 activities. Demo. Flame Surfer Kathy Spignese will show us how she creates cabochons at the torch. Kathy will demonstrate different types of mandrels and describe options for incorporating cabs into jewelry. Raffle. We will have a nice selection of tools and supplies in our raffle. Tickets are $1 (6 for $5) and the proceeds support BOC and special chapter events. Beads of Courage Donation. We need your help to make lots of Courage beads, those with a special theme, size, texture, or sculptural element. Remember, your stash of beads that didn’t turn out perfect, but are too nice to discard, make perfect Courage beads. Those imperfections to you are extra personality and interest to a child or teen. Polymer clay beads are also welcome and are in demand for BOC. Help us make California again the winning state in the September Bead Challenge. If you would like some inspiration, I have included a tutorial at the end of this message. Prizes. We will offer two prizes at our September 8 meeting to reward those that bring in the most courage beads. One prize will be given for the greatest number of courage beads of any style (not spacers). We will also give another prize for the most beads that are inspired by this month’s tutorial. To qualify for these prizes, you must package your courage beads in a clear bag and label with your name and number of beads. Thanks in advance for your participation. We will be getting up early to beat the heat and make beads for BOC at PAG on Saturday, September 15. Our goal for this event is ambitious: to make 100 glass courage beads and 100 polymer clay courage beads. We will provide the supplies and food; bring your tools and energy for this fun event. SCFS also has the honor to be one of 20 U.S. groups hosting an open studio for BOC members/friends in September. I’m working with BOC regional board member Chrissy Peterson to get the word out to the local BOC community about our event, and I expect we will have some visitors anxious to meet you and see you at work. Open torch. We will have a full complement of torches available for your use in the workshop. Please bring your own tools, glasses, and any special supplies. We will provide a large assortment of glass, sample beads, and tutorials for you to create with. Polymer clay beads. We have prepared a wonderful selection of canes for you to incorporate into polymer clay beads. All clay and supplies will be provided. This is a great way to take a break and relax while waiting for a turn on the torch. Any visitors will also be encouraged to make beads with your guidance. BOC activities. Volunteers from BOC will staff several tables for BOC activities and fund raising. These will include an opportunity to sponsor one of your courage beads for a BOC member and stringing beads to make a courage clip. Come to our Sept. 8 meeting for more details. This month’s tutorial suggestion is inspired by our open studio event. We hope to have lots of visitors, so let’s make a batch of other worldly visitors to join the party. 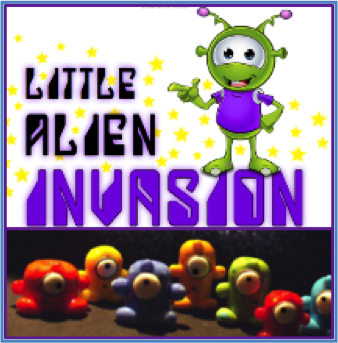 This easy alien bead provides lots of opportunities for creativity, through different colors/decorations and creative use of eyes, horns, arms, and feet. Remember to make any appendages robust so they will stand up to the extra love from BOC members. This tutorial is authored by Heather Sellers and is from her first volume of BOC tutorials called “Born of Fire, Glass, and Love”. The collection is available from Diane Woodall and Soda Lime Times. Get the tutorial here.